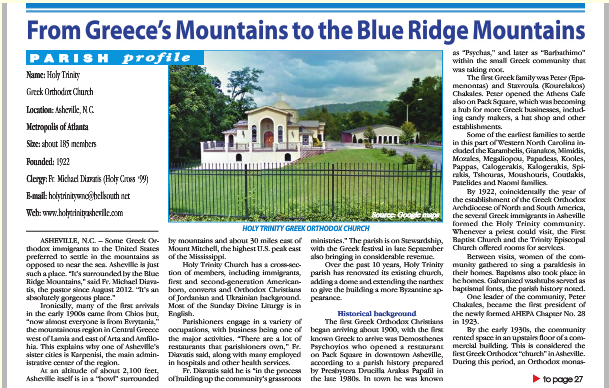 "Some Greek Orthodox immigrants to the United States preferred to settle in the mountains as opposed to near the sea. Asheville is just such a place. "It's surrounded by the Blue Ridge Mountains," said Fr. Michael Diavatis . . . It's an absolutely gorgeous place." Ironically, many of the first arrivals in the early 1900s came from Chios but "now almost everyone is from Evrytania," the mountainous region in Central Greece west of Lamia and east of Arta and Amfilohia. . . . The first Greek Orthodox Christians began arriving about 1900, with the first known Greek to arrive was Demosthenes Psychoyios who opened a restaurant on Park Square in downtown Asheville . . . . In town he was known as "Psychas," and later as Barbathimo" within the small Greek community that was taking root. The first Greek family was Peter (Epamenontas) and Stavroula (Kourelakos) Chakales. Peter opened the Athens Cafe also on Pack Square, which was becoming a hub for more Greek businesses, including candy makers, a hat shop and other establishments. Some of the earliest families to settle in this part of Western North Carolina included the Karambelis, Gianakos, Mimidis, Mozales, Megaliopou, Papadeas, Kooles, Pappas, Calogerakis, Kalogerakis, Spirakis, Tshouras, Moushouris, Coutlakis, Patelides and Naomi families.